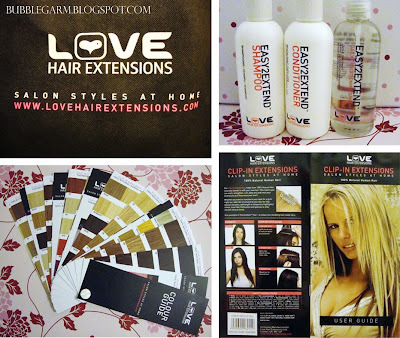 Yesterday I went on a little shopping spree, I needed a few things as a lot of my products had run out. The first thing I needed was a tinted moisturiser, I decided not to repurchase my Bobbi Brown one as it finishes SO quickly. I opted for the You Rebel SPF 15 by Benefit instead. I used this a long time ago, but hated it as it made me look orange and binned it. I told the SA my situation and she assured me that in the past there was a dodgy batch and that I could have returned it for an exchange. Indeed the colour of this tinted moisturiser is a lovely brown colour, the texture is quite thick but easily absorbed, a little goes a long way. I used it today and I have to say I loved the effect. 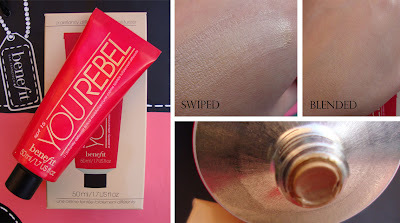 It was a perfect colour match, it gives light to medium coverage, evens out my skintone and makes me glow. This tinted moisturiser is available in only 2 shades, this one and a light one. This is a "foundation faker" meaning it doesn't look like your wearing foundation even though you are. 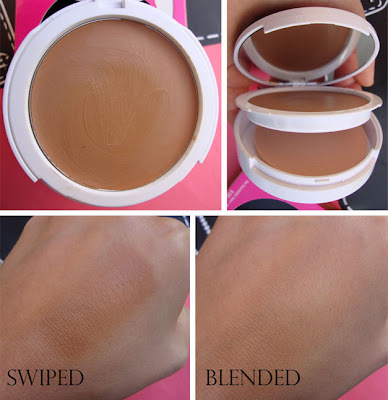 I certainly agree with this as the texture of this is so light, highly pigmented yet smooth. I purchased this once before, I loved the packaging of this cream compact but hardly used it as it was way too dark for my skintone. This is available in 2 shades, a normal one and a deep one. I purchased the deep as it seemed a closer match. My skintone is somewhere in between both. Once I had figured out a use for this I ran out of it in no time. I basically used it to contour my face with a Mac 187 brush, it acted as a bronzer with no sheen, shimmer or glitter. Very natural looking and I will be using it for exactly that again. FYI: This has no SPF. Luckily for me, The Benefit boutique in Carnaby St, London had a promotion on. I'm not sure if that's worldwide? 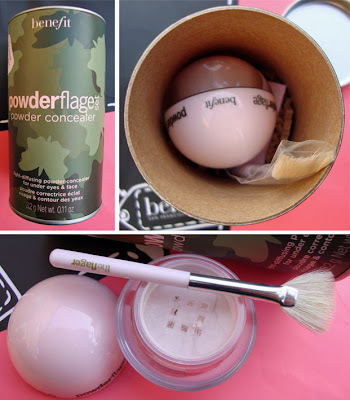 With any 2 purchases you received Powderflage, a light diffusing pale pink powder concealer. I have never tried this but haven't heard too many great things about it. However, that still doesn't put me off, everybody is different and likes different things. Just because something works for me it doesn't mean it will work for you. This will be interesting to test! I also received a lipgloss as a gift, I love the "Her Glossiness" lip glosses but they have been discontinued, why? Who knows. 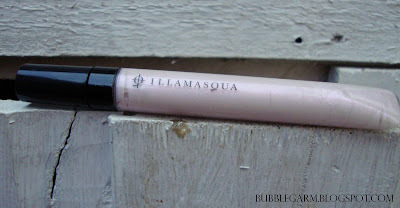 The scent of this lipgloss is amazing, it's exactly the same as the her glossiness tubes. "Fresh Squeezed" is a pretty coral colour with a slight shimmer, medium pigmentation with a gloss finish. I went to Mac, and none of the new collections caught my eye, nothing exciting for me. I have lived without Fix + for a while now and was missing it greatly. I love Fix +, perfect to set my makeup or to freshen up. This is daily skin cleanser, I also had a sample of this from my previous trip and loved it. 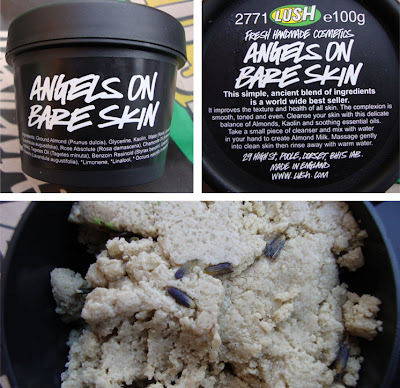 It has almonds, kaolin and lavender to improve skin tone, cleanse and balance the skin. You basically take out a little chunk, add water to it to form a liquid paste and apply to your skin. I also purchased the 'Honey I washed the kids soap" and received the 'Godmother' soap free as I spent over a certain amount. They both smell divine! I also got a sample of 'Coal Face' which is a facial cleanser... interesting! 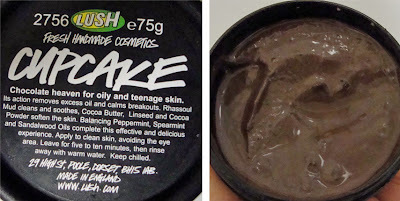 This is supposed to be chocolate heaven for oily and teenage skin. It contains Rhassoul mud, cocoa butter, linseed, cocoa powder, peppermint, spearmint and sandalwood oil to cleanse, soothe, remove excess oil and calm breakouts. Sounds good to me! Wooo, I'm all set for my holiday in Turkey! :) I will be going on Thursday for 12 days, *yay* well deserved! 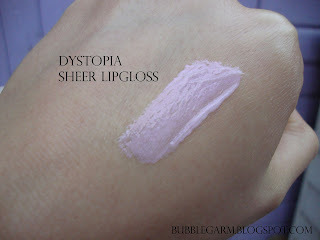 Illamasqua says: "Dystopia is not for the faint-hearted, Dystopia is a strong statement of defiant confidence. Where the dark meets the light. Monochrome shades build and blend, brought alive by flashes of intense pink and lurid purple, while dazzling pigments, metallic textures and iridescent finishes all add to the drama of this strikingly uncompromising look. As the nights grow longer, bring your alter ego out of the shadows and illuminate your individuality." I was sent a few things from this collection, it's very different from 'Sirens' but I like it as it's the complete opposite. A fresh change always makes me smile. Lets get examining shall we? 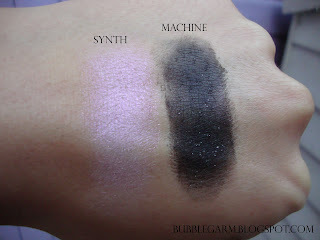 Here are swatches of 'Synth' and 'Machine'. 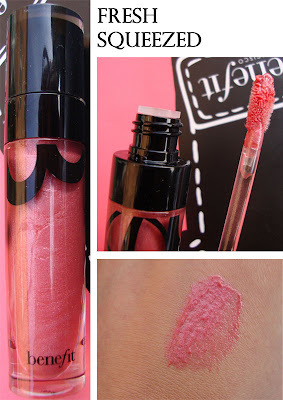 Here's a swatch of the sheer lipgloss. I dyed it a couple of days ago to reveal a super dark brown which was way too harsh on me. After washing my hair several times, adding two packets of light brown highlights to the parting area and applying the Marilyn Lush hair mask this is the result. 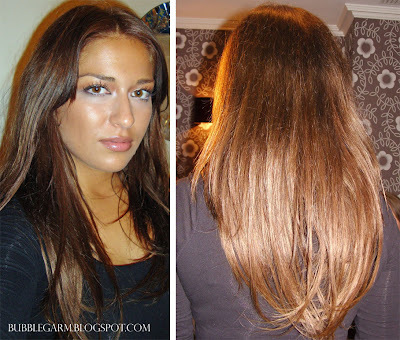 A medium brown with subtle lighter tones in them. I didn't properly style my hair here, it's just air dried then I ran a fat bristle brush through it to smooth it out a little. I think this colour suits me a lot more than the lighter shade of brown as it helps to frame my face. What do you think? I was rather pleased with my makeup after having a disastrous time with my tinted moisturiser and starting all over again. Eyes: Mac Vellum e/s all over the lid. Bourjois gold bronzing powder in the crease, Nars Casino bronzer on outer V. Urban Decay 24/7 pencil in Zero on outer upper & lower lashline. Benefit eyebright on waterline, inner corner & brow highlight. Chanel Exceptionnel mascara. Face: Revlon colorstay foundation. Bourjois gold bronzing powder. Cheeks: Nars Casino to contour and Sin as blush. Lips: L'oreal Cappuccino lipliner & L'oreal glamshine 101 Pink Moon. This months UK issue of InStyle magazine is giving away a free travel size L'occitane shea butter hand cream worth £7. I have actually purchased this hand cream over and over again in the past. It's one of the best handcreams out there in my opinion. It's SO rich and moisturising, it makes a great overnight treatment or an amazing rescue for dry chapped hands. Read more about it HERE. The last time I went to Lush was 2 years ago when I purchased some bath bombs and soaps. This time I went with other things in mind based on reviews and recommendations! You all know that I am a "natural" addict so fresh handmade cosmetics seem VERY appealing... I'm surprised I didn't get all of this sooner. It's just when people go on too much about a brand it makes me not want to have it... weird I know. 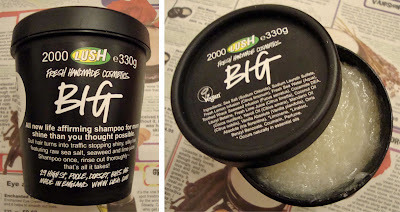 Big: I have heard so many good things about this shampoo, I seriously can't wait to use it! 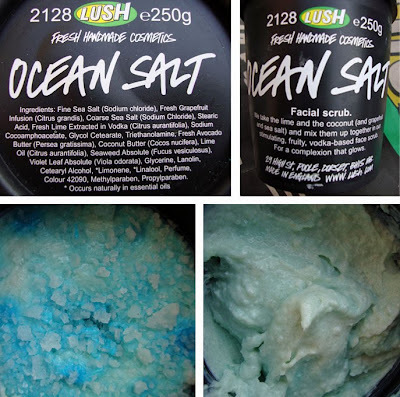 It has raw sea salt, seaweed and lime juice for shiny bigger volumised hair. Price £9.60. 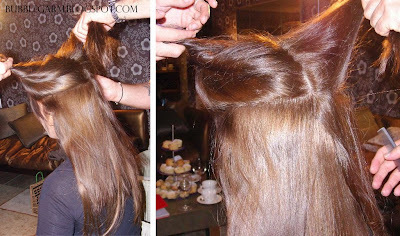 H'Suan Wen Hua: A hair mask that you apply prior to shampooing on dry hair, leave it for 20 mins and then shampoo and condition. Price £7.39. Veganise: Mini conditioner as I wasn't sure which one to get, one of the girls that worked there recommended this as it had lemon and seaweed in it and said it will go very well with big. Price 100g £3.40. I also got a sample of the Retread conditioner. Babyface is something that I knew I wanted. It's basically a makeup remover. Price £3.40 and the tin was £2.49. I got 2 samples of facial exfoliators. I wasn't sure which one to get so hopefully one of these will be better than the other. One is Ocean salt and the other is Angels on bare skin. I also knew that I wanted the tea tree toner based on rave reviews! Price 100g £3.10. My skin is sensitive but dry so I opted for Celestial facial moisturiser. Price £9.96. I also got a sample of Imperialis facial moisturiser which is for combination skin and the Vanishing cream which is for oily skin. That's it from me... Is there anything you recommend? 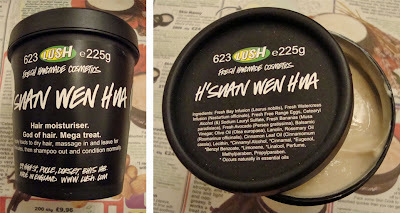 I have to say all of the staff at Lush were so friendly and helpful, I really had a fantastic shopping experience. One of my favourite places to shop is Mango. I nearly always managed to find something. I was on a hunt for a big cardigan and I found it. Yesterday I saw a girl wearing the most amazing cardigan and I kicked myself afterwards for not stopping and asking her where it was from. But, guess what? I found the exact same one in Mango!!! Result! :) Price £49. This cream ruffle skirt I also had to have, it's high waisted and looks so cute on. Price £28 on sale from £42. It has navy stripes and I plan on wearing it with navy tights, navy top and flat brown boots. 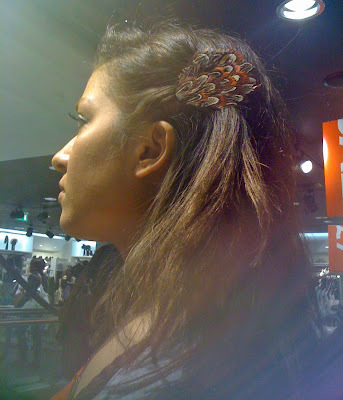 I saw this feather Hair clip from H&M and had to have it, I love the colours. Price £1.99. I purchased these lovely deep brown leather boots from New Look, I needed some flats and these are perfect. 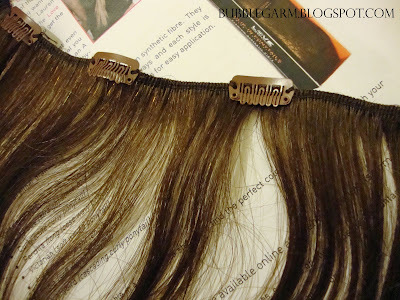 They also match my brown fringe bag from Warehouse! *yay* Price £55. I couldn't go home without popping to Hollister! :) My mum got me this long sleeve navy top, I love the detail on the arm, I'm such a kid I know, but I love it! I don't care, it looks totally cool on! I plan on wearing it with light stonewashed jeans. :) Price £24.